My mom is down for a bit and we’re going to get the babes ready for the fall. Big girl bed, coat, pants, boots…after all that shopping I think we’re going to need dessert. I have an abundance of milk, once again have eggs and the driving, overwhelming need for caramel. I trolled for a recipe that I could adapt to use goat’s milk (whole) and also an easy caramel that would be happy to have the addition of salt. I found myself lusting after the gorgeous photos on Tartlette’s blog, this is one seriously talented girl. Her photos are stunning and I haven’t had any of her recipes fail me. This one is no exception. I’ve, as usual doubled the recipe. Who wants to have one portion of dessert? What are you expected to eat by the light of the fridge at night if you only make one portion of dessert per person? 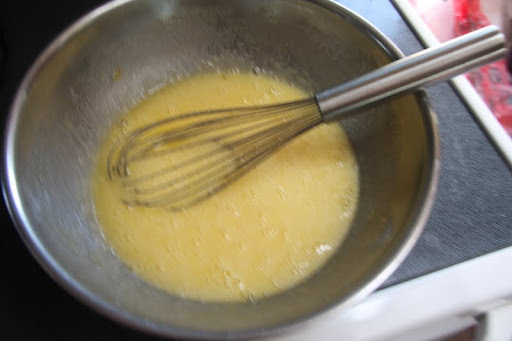 Simply take 8 eggs and 2 cups of sugar and beat them together until they are pale. 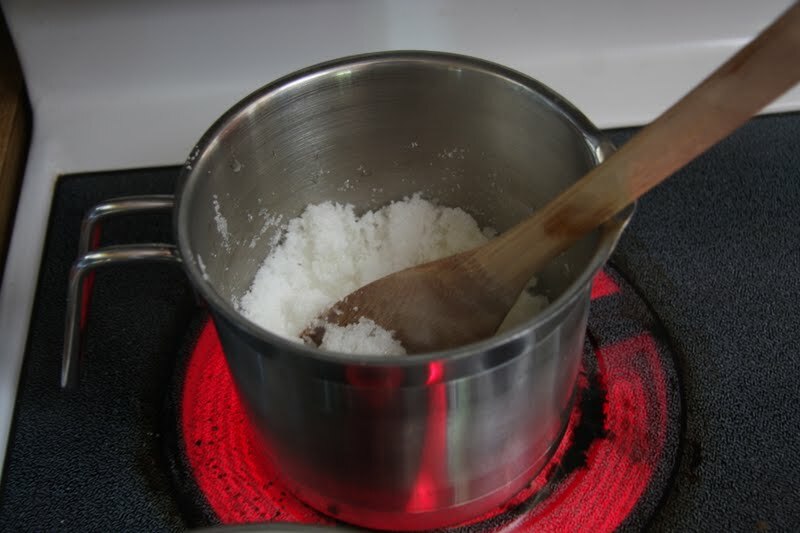 Scald (heat quickly but don’t boil) 4 cups of whole milk and slowly beat it into the eggs. Add a whole pod of vanilla (just squish out the good parts). 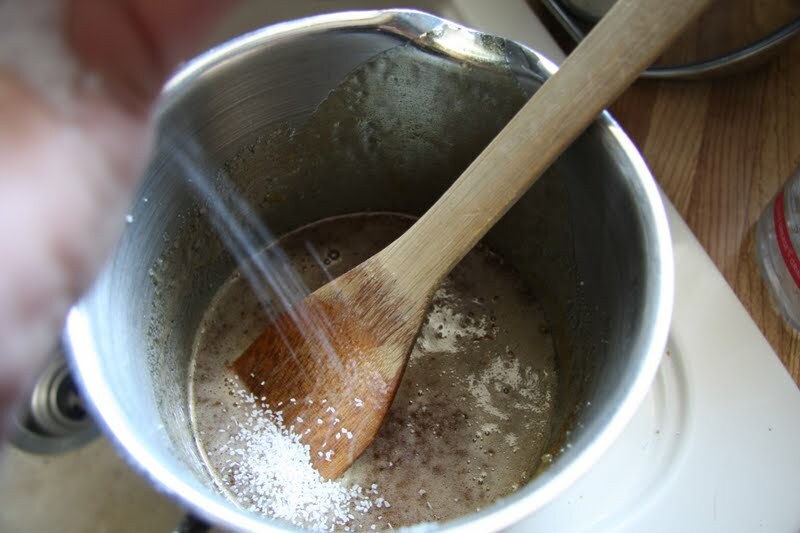 While the milk is heating take 2 cups of sugar and 2 T. lemon juice and in a heavy bottomed pot boil together into an amber coloured caramel. BE CAREFUL! Caramel is one of the most wonderful things but it is also dangerous, don’t leave it for a second and take it off the heat just before you feel that it is going to be dark enough. It will continue to cook and burnt caramel is a sad tragedy but not as sad as a hot sugar burn-that will leave a mark and it’s not the memory you want to have of your lovely dessert. 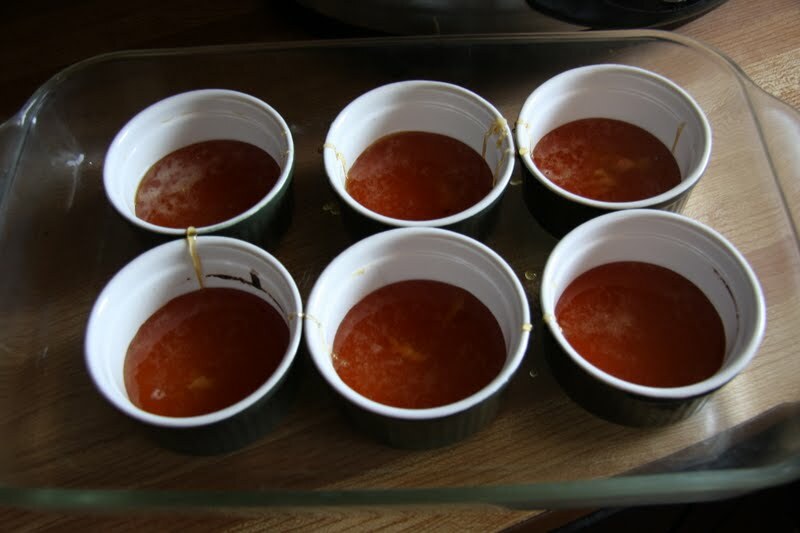 and divide the amber deliciousness between eight ramekins that are sitting in a pan (don’t fret-the other two are off to the side). Let set for a couple of minutes. 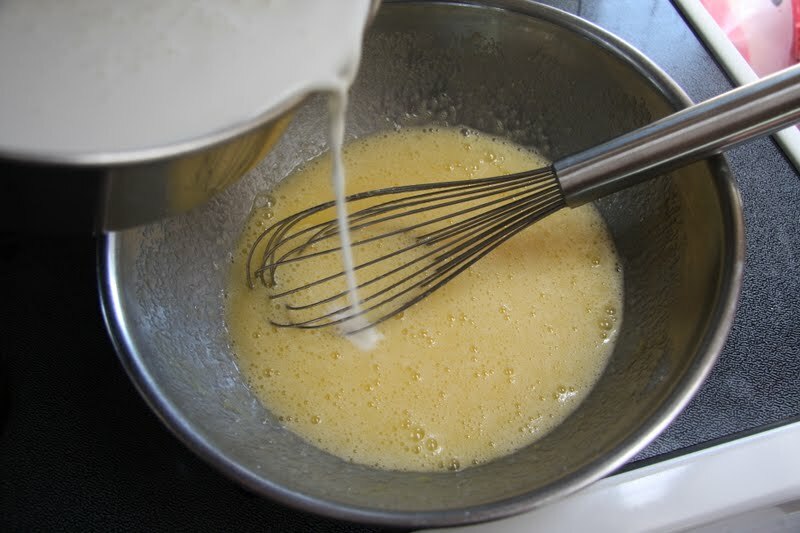 Pour the custard mixture over the top. Put in a heated oven (350 degrees) and then fill the pan with hot water. 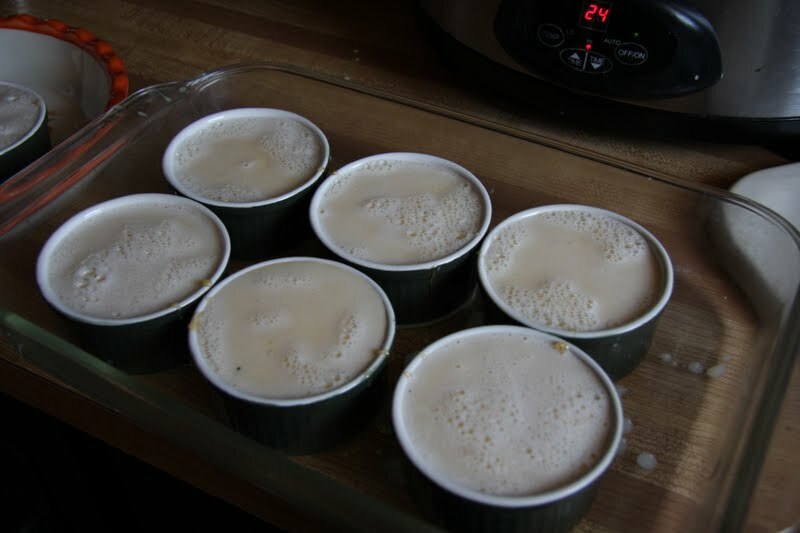 Bake for 30 minutes until the custard is still a bit jiggly and let set in the fridge. Sigh. I wish my photos were as wonderful as hers. Effort counts, my dear. It counts big time.Love the ribbon idea, too, so there. Don't compare yourself to Helene! She does have a book on how to take photos. 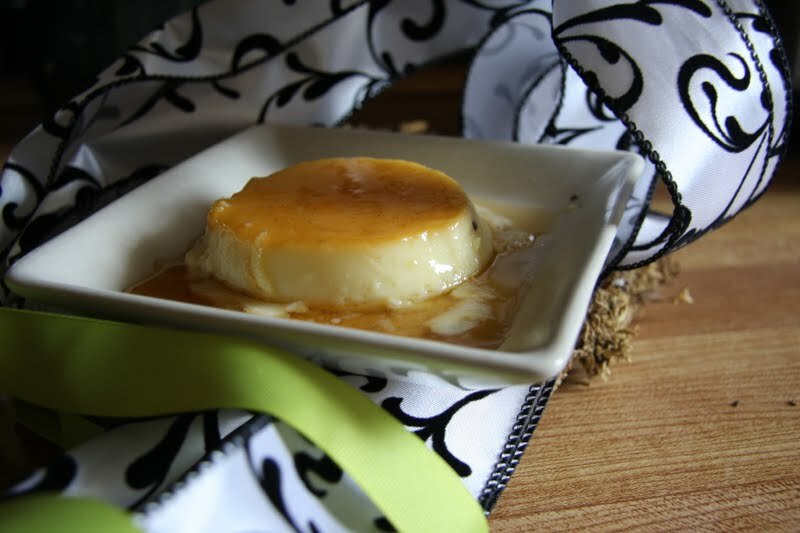 =)I think the creme caramel looks totally delicious! Looks great! I think your pictures are pretty good. OMG! Me and my oldest son LOVE caramel!! Thanks guys! My type A side though says I should be perfect, that's doable right? Oh…this is absolutely what my sweet tooth is craving now. Too bad you don't deliver.